fohmo.com allows Cameroonians resident abroad to send great gifts to their relatives in Cameroon. They can also top up your mobile phone with talk-time credits from anywhere in the world by using a Credit Card. Registering from Cameroon: If you are residing in Cameroon, you will NOT be able to use our service to purchase gifts or top up mobile phones due to security and legal reasons. However, you can use our service to ask your relatives living abroad to buy you a gift or request for them to top-up your mobile phone with talk-time credits. Receiving Gifts: When the Gift is purchased via our website, you will be notified by text and one of our Staff will contact you to arrange delivery or collection of the gift. Receiving Mobile Phone Credits: When your relative abroad buys mobile phone credit, the credit is automatically sent to your mobile within 30 minutes from any of our network partners (MTN or ORANGE). 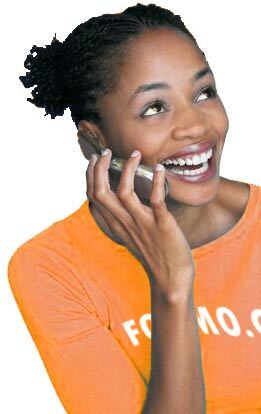 You will also receive a text message on your mobile phone telling you that you've received credit. NOTE: If you do not provide the correct phone number to the buyer, we will not be held responsible as we do not issue refunds for using the wrong numbers. Due to conditions beyond our control, our network partners (MTN & ORANGE) may not be able to transfer credit to your phone within the 30 mins mentioned above. We will keep you informed in the event of our inability to send credit to your phone in time.